So what does that mean to no longer look at others or even Christ from a human point of view? I mean, how can we do anything different? We ARE human. And we are meant to be human, human as Christ was human, fully human. It means that, once again, we are called not to jump away from this world but to look at things differently, to bring this perspective of this “new creation” into not only our lives but the lives of others as well. We have been reconciled with God through Christ, according to Paul. The Divine presence of God has come to dwell with humanity for all. We have been given that which will sustain us beyond what we perceive as our wants, our desires, and even our needs. I think that most of us sort of pretend to be human. We know what is right and good and we try but fear and our need for security seeps in when we least expect it. 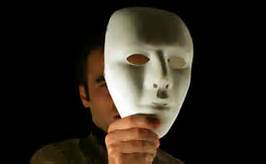 So we once again don our masks so that we will look faithful and righteous and more put together. But we read here that we are called to look at everything with a different point of view, something other than a “human” point of view. It’s about a change in perception. That’s what this journey does. It changes our perspective. Where we once believed in Jesus as the one to emulate, the one who came to bring us eternal life, we now view Christ as the Savior of the world, the one that has ushered the Kingdom of God into everything, even our humanness. It changes not only the way we view Christ, but also the way we view the world. We live as if the Kingdom of God is in our very midst–because it is. Our change in perception means that we unmask, that we find our real self, that self that sees Christ’s presence even now and sees all of God’s children as part of that Presence. Andre Berthiame once said that “we all wear masks and the time comes when we cannot remove them without removing some of our own skin.” In other words, sometimes it is hard and perhaps a little painful, but it is the way to reveal who we are called to be. No longer do we live our lives with some faint vision of a “someday” or a “somewhere” that is out there and to which we’re trying to journey. God’s Presence, God’s Kingdom, is here, now. And as God’s new creation, we see that the air is thick with its presence. And as God’s children, our very lives are so full with God’s Presence that we can do nothing else but journey with it. As you journey through this Lenten season, begin to look at things differently. Rather than limiting yourself to a human view with your pre-conceived perceptions, open yourself to what God is showing you and begin to live “as if”. Am curently reading April d. DeConik’s: Gnostics The Old New Age, the Gnostics evedently did not believe Jesus was Human.